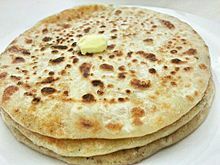 Aloo Paratha (Bengali: আলু পরোটা, Hindi: आलू पराठा, Sylheti: ꠀꠣꠟꠥ ꠙꠞꠐꠣ, Urdu: آلو کا پراٹھا‎; "potato paratha") is a bread dish originating from the Indian subcontinent; the recipe is one of the most popular breakfast dishes throughout western, central and northern regions of India as well as in Pakistan. Aloo parathas consist of unleavened dough stuffed with a mixture of mashed potato and spices, which is rolled out and cooked on a hot tawa with butter or ghee. Aloo paratha is usually served with butter, chutney, or Indian pickles in different parts of northern and western India. ^ Goyal Siraj, Ashima (8 January 2015). "Breakfast like a king: Here's how to make Aloo Paratha". The Indian Express. Retrieved 7 April 2019. ^ Anu Canumalla (16 October 2008). Paakam: Everyday Indian for a Vegetarian Lifestyle. AuthorHouse. pp. 75–. ISBN 978-1-4685-8061-7. Retrieved 26 March 2013. ^ "Quick Recipe: Aloo Paratha". This breakfast-related article is a stub. You can help Wikipedia by expanding it.